As we’re nearing release for my little indie game Balls, I think now is probably a good time to post up a development log and check out how much progress was made since the last log a few months ago (Once again, since there’s quite a lot of progress to summarise, everything will be broken into a concise month by month format to keep things short). Added some more new icons. These included buttons in the options menu to mute the sound and music (replacing the sliders I had previously) as well as brand new buttons for the game over screen. Made the ball’s touch area slightly larger so people can touch slightly outside of it. Made the ball size smaller and started work on replacing the look of the windzones using particle systems. Added some randomly generated colours to the windzone design. Added some new star icons to indicate the game’s current difficulty level. Replaced the UI panels with newer “flat” toned ones. Changed the background colour of the main menu. Replaced the game’s current font for text and UI. Redid the sharing and help icons so that they used the new font instead. Made some optimisations to the graphics and UI text elements. Created separate panels to change the ball and trail colours (instead of cycling through them one by one). Made changes to how certain scenes were loaded in the game by making them load asynchronously. Redesigned the spikes to use a style similar to the ball itself with some added lerping between colors. Increased the overall game ambience. Made changes to the windzones so that their magnitude and number of particles emitted is based on the current difficulty (i.e. small breezes and very few bubbles on easy to huge gusts and lots of bubbles on hard). Started work on a shop system for the game where you can buy/unlock colours for the ball or trail using either the coins collected in game or with real money/in-app purchases (Currently Ongoing). Created an interactive tutorial level to teach players how to control the ball. 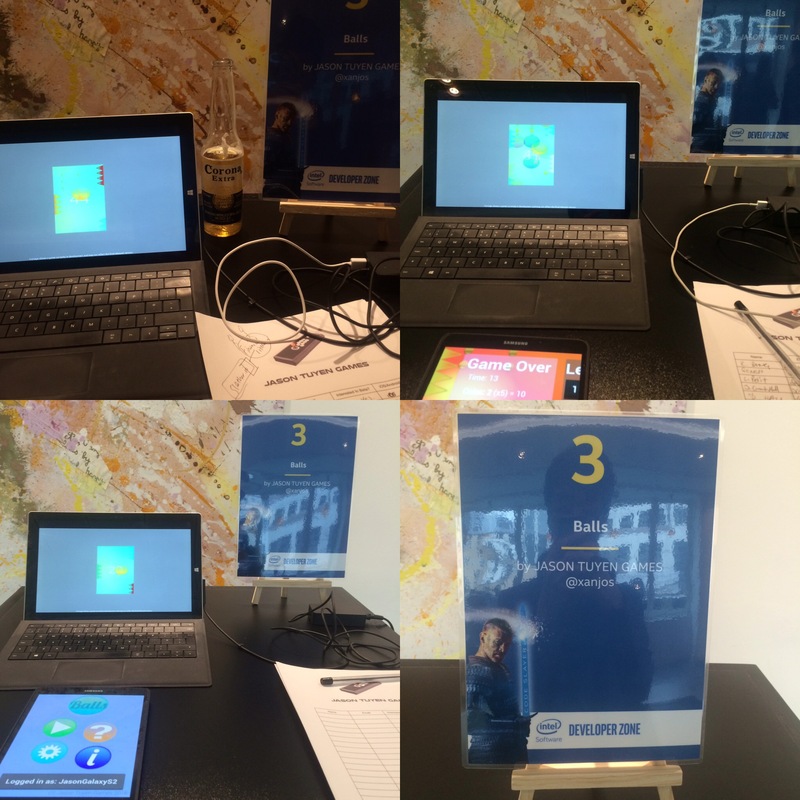 Exhibited the game in front of a large crowd as part of the Intel Buzz Workshop London 2016 Developer Showcase. In addition to the game’s ongoing development, I’m also currently running a beta test on Android devices (which you can sign up for by heading to bit.ly/ballsandroidbeta) with the next build coming within the next week or two. The game itself is almost ready for release and I’m aiming for a soft launch (on Android) by the end of the summer. As for the next development blog, that would most likely be up sometime in August/September but as always, you can follow me on Twitter or check out my Facebook page for more regular updates on the game.